Compassion and understanding Dana Sacco brings qualities to your eye care experience like no other purveyor of fine eye wear. Dana has extensive clinical experience that gives her clients the confidence to know that she can help them in all aspects of their eye care from understanding their prescription to enjoying their glasses and contacts for years to come. Dana is a mom of twins with long-standing roots in the community. She grew up in Oshawa and has worked as an Optician since 1995. Christine joined the Inspired by Rossland Optical Team 20 years ago as an administrative assistant. She took a natural shine to the profession and has been a licensed optician since 2001. 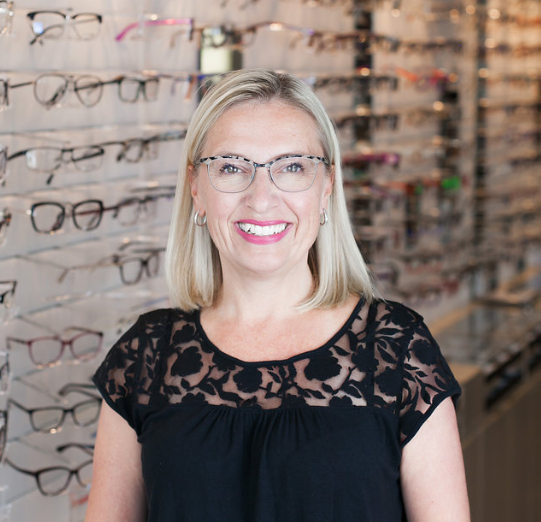 We are so excited to congratulate her on 20 years at Inspired by Rossland Optical! In addition to her role as an Optician, Christine is the General manager and Inventory Specialist. Inspired by Rossland Optical enjoys a tremendous reputation for unique frames to create you signature look and Christine shops the world to bring those frames right here to Whitby, Ontario! In her network of suppliers, she also sources the newest technology in prescription safety eye wear, swim goggles and various sports solutions. Christine is involved in many charitable efforts. She spearheads many of the efforts to raise food and supplies for the New Life Neighbourhood Center and the food bank that serves south Oshawa. Tanya is a 20 year veteran of the Optical industry with experience in the laser eye care industry. Tanya also brings her personal experience of being a hockey mom right here in Whitby and specializes in sports eye wear for active kids and adults. Tanya and her family are active in the community through her kid’s school and sports. Nadir has over 20 years of experience in the Optical industry. He started with Inspired by Rossland Optical less than a year ago. He manages our Ajax location and is a member of the Ajax Board of Trades. Nadir is an enthusiastic hockey dad, but loves many different sports. Make sure to ask him about his favourite movies because he always loves watching something new!